This study attempts to measure the scope of government subsidies in Canada using three data sets. The first is from Statistics Canada from the 1981 to 2009 fiscal years. 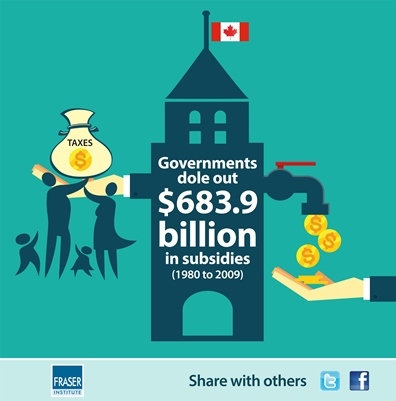 This data shows that between April 1, 1980 and March 31, 2009, federal, provincial, and local governments spent $683.9 billion on subsidies to private sector businesses, government business enterprises, and consumers. The federal government spent the most, with $342.6 billion spent between 1981 and 2009 on such subsidies. The province of Quebec was next, where subsidies have increased in almost every year with few exceptions and where subsidies went mainly to private and government business: $115.5 billion between 1981 and 2009. The second set of data is from Industry Canada. Between 1961 and 2013, the federal department of industry disbursed $22.4 billion to businesses. As many of these corporations or their parent companies are large and well established, the justification for such subsidies appears to be weak. The third dataset is derived from VIA Rail annual reports. The company has received $4.5 billion in operating and capital subsidies from the federal government between 1996 and 2012. On the specific question of subsidies to business, governments should support international efforts to end subsidies, including strengthening bilateral and multilateral free trade agreements to more clearly prohibit such subsidies. It is in Canada?s interest to reduce rules against our imports and to be able to compete with non-subsidized companies from other jurisdictions.